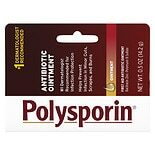 Shop Polysporin First Aid Antibiotic Ointment (1 oz. )1 oz. Shop Polysporin First Aid Antibiotic Ointment (.5 oz. ).5 oz.